Nikon's venerable 12-24mm ultrawide zoom has the benefit of a reasonably fast f/4 aperture that remains constant throughout the zoom range. 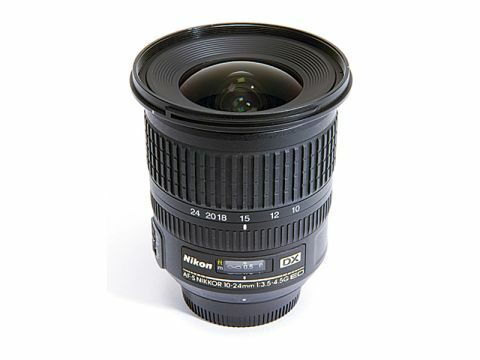 By contrast, the newer 10-24mm lens has a variable f/3.5-4.5 maximum aperture but, crucially, it extends the zoom range where it matters most: at the wide-angle end, effectively boosting it to an equivalent 15mm compared with 18mm for the older lens. A 3mm difference might not sound like much, but it makes a massive difference to the angle of view, enabling you to shoehorn a fair bit more of a scene into the frame. As a G-series lens, there's no aperture ring on the lens barrel, but this omission is shared by every other lens in the group. Importantly, the Nikon bears the AF-S designation, featuring whisper-quiet, super-fast and deadly accurate Silent Wave autofocus performance. Indeed, the autofocus proved the fastest on test and, like the Canon USM and Sigma HSM systems, comes complete with the luxury of full-time manual focus override. Compared with the Canon lens, the zoom and focus rings on the Nikon feel a bit sticky and slightly lacking in smoothness. In other respects, however, build quality is pretty good and optical quality is enhanced by two ED (extra-low dispersion) elements, three aspherical elements and Nikon's SIC (super integrated coating), which aims to increase light transmission through the lens, while improving colour consistency and reducing flare.